According to a new market report published by Transparency Market Research entitled “IBM Bluemix Services Market–Global Industry Analysis, Size, Share, Growth, Trends, and Forecast, 2018 – 2026,” the global IBM Bluemix Services market was valued at US$5,452.5 Mn in 2017 and is expected to expand at a CAGR of 24.55% from 2018 to 2026, and reach US$ 38,847 Mn by the end of the forecast period. A prominent reason for the expansion of the IBM Bluemix Services market is the simplicity and speed associated with the usage of IBM Bluemix services. There are a variety of simple and agile services that are offered under the IBM Bluemix platform. IBM Bluemix services focus more on the DevOps model, which is basically a set of processes that reduce the hassle for application developers to deploy software on any platform by means of automation. The integrated environment that IBM Bluemix offers facilitates automatic delivery of codes for developers without the hassle of building and debugging installation scripts. This results in reduced time for delivery of code into the hands of testers and end-user community.Thus, the above factors helps developers to focus more on the coding part of the application and not on the installation, as it is well taken care of in the IBM Bluemix environment. IBM Bluemix also permits users to employ development tools according to their ease, which assists them to develop applications in the best comfortable way. A key trend prevalent in the IBM Bluemix Services market is the increasing adoption of IBM Bluemix Services by the leading players of the IT industry to gain a competitive edge over their peers. For instance, in February 2017, Wipro launched its Data Discovery Platform, which is a big data analytics-as-a service solution, on IBM Bluemix. The platform is developed on IBM Bluemix with the help of IBM Big Insights and IBM dashDB. IBM Bluemix helps the continuous provisioning of new functionalities to their applications in a better way.Soothing partnership programs being hosted by IBM also promote different players to establish partnerships and utilize the benefits offered by IBM Bluemix.For instance, in February 2017, Bosch and IBM announced their collaboration involving availability of Bosch IoT Suite services on IBM Bluemix and IBM Watson IoT Platform for clients to update IoT devices. This partnership is expected to enable both companies to offer innovative technological enhancements to clients across the globe. 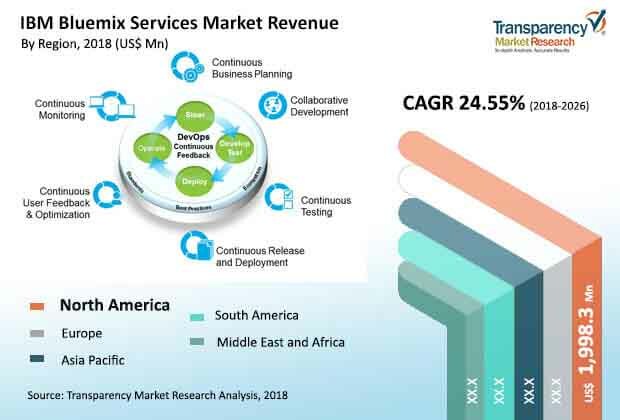 Based on application type, the global IBM Bluemix Services market has been segmented into DevOps, application services, analytics, Watson, mobile, IoT, and others. In 2018, the DevOps segment was a prominent segment, in terms of revenue. DevOps service offered by IBM Bluemix focuses on reduction of downtime of redeploying applications; hence, they are increasingly used for development of applications by IBM Bluemix partners. Users can create DevOps toolchain, which includes IBM cloud services, third-party services, and open source tools, which make development and operations easier to manage. Furthermore, DevOps brings together development, operations, and testing to ensure agility in order to address customer feedback. The Watson segment is expected to expand at a significant CAGR of around 24.61% during the forecast period. This expansion can be attributed to the extensive implementation of Watson services across various industries including automobile, healthcare, transport, and retail. A significant quality of Watson, which is responsible for the rapid expansion of the segment, is the allowance of integration of powerful AI into the application to be developed by developers. Based on end-user, the market has been divided into BFSI, IT & telecom, healthcare, retail, federal, media and entertainment, and others. Others include aviation, transport & logistics, manufacturing, automotive, and energy. In 2018, the BFSI segment is expected to be the topmost revenue generating segment, as a large number of banking and insurance institutions are leveraging IBM Bluemix services to provide seamless services to their clients. Furthermore, these companies handle sensitive and confidential data, which prompts them to opt for hybrid cloud deployment or IBM private cloud deployment, wherein the companies can choose to keep a part of or the entire data behind their firewall. The healthcare segment is expected to expand at a CAGR of 24.89% between 2018 and 2026. This expansion can be attributed to the increasing usage of Watson services by small as well as established healthcare industries. Blueprint Genetics, based in Finland, delivers answers for medical professionals by taking samples from hospital clinicians that helps them treat patients with rare inherited diseases. In September 2016, Blueprint Genetics leveraged Watson technology to gain insights from the enormous amount of data generated from the user database. IBM premium business partners Enfo Rongo and Elinar Oy, Ltd worked with Blueprint Genetics for the development of hybrid cloud solutions to store, analyze, and manage the data. This reduced the amount of manual work done in gathering the data by as much as 8% and delivered results in a short span of time. Based on deployment model, the market has been divided into dedicated, public, and private. Among the three deployment models of IBM Bluemix services, in 2018, the public model is the topmost revenue generating segment owing to its low charging cost, as compared to the other two segments. The public deployment model provides better scalability, flexibility, fast deployment, and ease of use to customers. Furthermore, the public segment is expected to expand at a significant CAGR of 24.80% from 2018 to 2026. In terms of geography, the market has been divided into North America, Europe, Asia Pacific, Middle East & Africa, and South America. In 2018, North America was the topmost revenue generating region, followed by Europe. The market in Asia Pacific is expected to expand at a considerable CAGR from 2018 to 2026 owing to its increasing adoption across a wide range of industries including BFSI and healthcare industry. IT companies in developing countries of Asia Pacific are witnessing significant expansion. The market in Asia Pacific is expected to expand at a CAGR of 26.50% during the forecast period. Key players in the market are offering various IBM Bluemix services and attaining Platinum status for its proper implementation to various end-users. Key players profiled in the global IBM Bluemix Services market include Tata Consultancy Services Limited, Infosys Limited, Capgemini, Robert Bosch GmbH, Datamato Technologies Pvt. Ltd., Prolifics, Inc.,Tech Mahindra Limited, Perficient Inc.,Wipro Limited, and DXC Technology Company.